Product news: every table, chair, lamp and light switch in this furniture collection by Italian designer Loredana Bonora is covered in crocheted yarns of cotton, PVC, plastic tape and even washing lines. Bonora made the red and white chair and hat stand (below) by crocheting barrier tape that reads 'work in progress', while the decorative circular pendant is made from the plastic wire used for washing lines. The pale grey chair has rings of crocheted cotton irregularly spaced on its legs and a plume of large black feathers on the seat back. The white table and white chair are both crocheted with PVC. Feathers have also been used to cover the bulbs of the two standing lamps, while the table lamps have crocheted shades. The gold chair was made with the small wires used to tie up chocolates boxes,while the fluffy white chair was crocheted with wool thread. Different crochet patterns appear in each piece of furniture, from simple circular designs on the white table to intricate flowers on the base of the recliner. Nodi Contemporanei, which means contemporary knots, is Bonora's first solo exhibition and can be seen at the Plusdesign gallery in Milan. The exhibition continues until 10th November at Plusdesign, Via Ventura 6, Lambrate, Milan. We've published lots of crocheted furniture on Dezeen, including a chair of resin-coated crochet flowers by Marcel Wanders and a set of handmade pendant lamps which decorated the Dezeen Super Store this summer. Photographs are by Carlo Beccalli. On the occasion of the Start Milano’s incoming opening events, Plusdesign presents Nodi Contemporanei (Contemporary Knots), the first solo exhibition of the Italian designer Loredana Bonora. 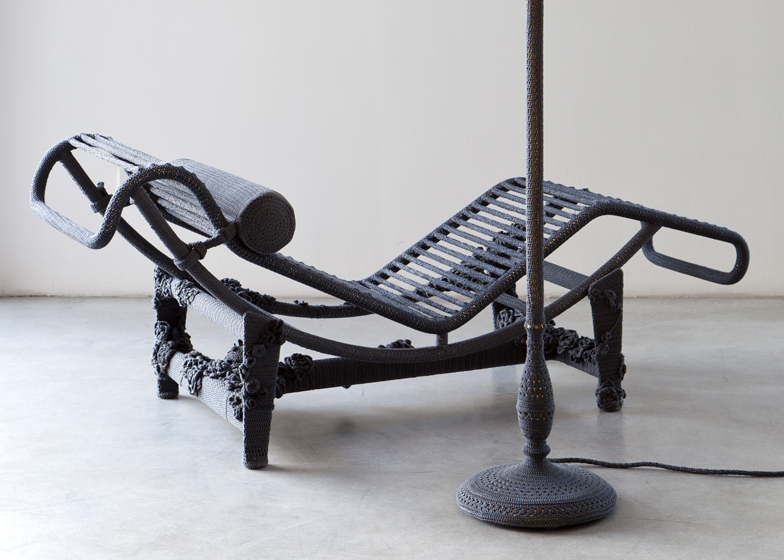 The show introduces a new collection of furnishings, tables, chairs, beds and lamps, entirely covered in crochet and artfully woven with unusual materials combined with traditional techniques. Loredana Bonora covers the design icons, revealing new and unique personalities. Through the transparency, unexpected details and provocative combinations, she gives the furniture a new character, changing their the story and releasing them from their own objectivity. With her crochet, Loredana Bonora does not redraw only the objects, but a whole world made of colours, feelings and soft lines woven with ability and extraordinary femininity. She draws on a scenario that belongs to her imagination and invites the observers to access a dreamlike dimension made of subjective feelings and emotions, free from all formal constraints. Loredana Bonora combines the traditional technique of crochet with ongoing creative research and the experimentation of new materials aimed to design unique objects. Yarns of PVC, the red and white stripes work in progress tape, clothes hangers or packaging, but also more classic yarns such as cotton and wool, are skillfully woven maintaining the same ancient craftsmanship but overturning the traditional beliefs, taking a fresh and contemporary brand new personality. Loredana is an Italian designer from Varese. She has been engaged for long time in a creative research that retrieves the traditional practice of the crochet to interpret the home furnishings in new ways. The use of non traditional yarns – such as plastic and raffia – and the experimenting of plot techniques with variable patterns, keep her updating this traditional handbuilt style with a contemporary taste.